While they are often docile captives, your pet garter snake may occasionally expel musk, defecate, thrash wildly or even attempt to bite you when you handle him. These behaviors tell you that your garter snake is feeling stressed, frightened or irritated. Avoid these unpleasant behaviors by learning how to understand what kinds of things will irritate your garter snake. Rather than opening your garter snake’s (Thamnophis sp.) cage, reaching right in and grabbing him, make sure that you do not catch him off guard. As snakes do not have eyelids, it is hard to determine whether they are sleeping when they lie motionless. Understandably, if you pick him up suddenly while he is sleeping, he is likely to act defensively. Avoid this by lightly tapping the cage a few times before you open it – once your snake flicks his tongue, he is awake and you can gently pick him up. As with most pet snakes, it is sometimes helpful to lift your snake with a snake hook or small piece of bent wire and then place it in your hand. Garter snakes have a variety of predators in the wild, including raccoons (Procyon lotor), kingsnakes (Lampropeltis getula) and birds of prey. When they are not basking, eating or engaging in another natural activity, garter snakes prefer to hide. If your snake does not have somewhere to hide, he will quickly become stressed, making him irritated when you handle him. Always provide your snake with at least one secure hiding spot – providing multiple hiding spots is even better. The best hiding spots have a low, wide profile; when your snake crawls into the hide, its back should lightly touch the top of the hiding spot. Inverted plastic plant saucers, with a door cut into the side, make excellent hiding spaces. Watching your garter snake too closely while it is eating may frighten him; this is especially true if he is eating large prey items like goldfish. 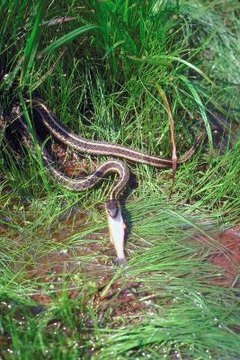 It may take a garter snake several minutes to eat a large item, and during this time, he is very vulnerable to predators. If a garter snake becomes frightened while eating, he may stop eating or regurgitate his prey. While watching your snake eat, try not to move very much and take a step or two back from the cage. Even the most docile pet snakes do not like to be restrained. When you handle your snake, keep your hands open, so that you can provide support without restraining his movement very much. On those rare occasions when it is necessary to restrain your snake, such as veterinary visits, grip the snake as lightly as possible, and only restrain him as much as is necessary.